Oxford City's American president and director Thomas Guerriero has quit the club citing ill health. Guerriero, 39, has been named in the United States as one of nine defendants in a $6.6m stock investment fraud case. A statement from the National League South club said he had been "seriously unwell for several months" and had recently undergone "repeated surgery". The Security Exchange Commission in the United States alleges fraud and conspiracy to commit fraud. The charges relate to the separate Florida-based Oxford City Football Club Incorporated - which owns 49% of its UK namesake. Guerriero has been unavailable for comment. Updates on this story and more from Oxfordshire. 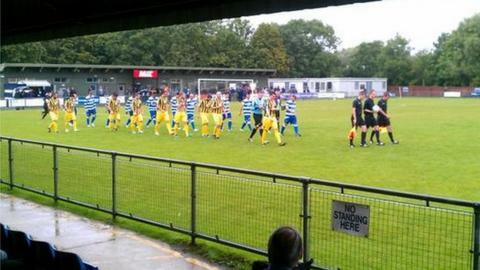 The Wall Street businessman became involved with Oxford City in 2013 with his sights set on guiding them to the Football League. "He's been a great help to the club and towards our business structure," club chairman Brian Cox told BBC Radio Oxford. "It's a shame what's happened, but you move on in life and City will carry on." City are currently third in National League South and knocked top-of-the-table Ebbsfleet United out of the FA Trophy in Saturday's first-round tie.